Parse T-SQL code, validate syntax and generate SQML batches. Load connection context and generate context XML. Generate XSLT template from analysis rules expressions. Apply XSLT transformation on the SQML of the current batch using all active batch scoped analysis rules. The analysis context and rule parameters are provided to the analysis rule as XSLT variables. Apply XSLT transformation on an empty document using all active Context Only analysis rules. The rules’ parameters and the analysis context are provided to the analysis rule as XSLT variables. The Context Only rules can be used to only analyze current database schema. This kind of rules does not depend on the analyzed T-SQL code, but only on the current connection context which is available inside the rule expression using the $context (the root Context node), $server (current Server node) and $database (current Database node) variables. Important for the Context Only analysis rules is that they are evaluated only once at the beginning of the analysis process. 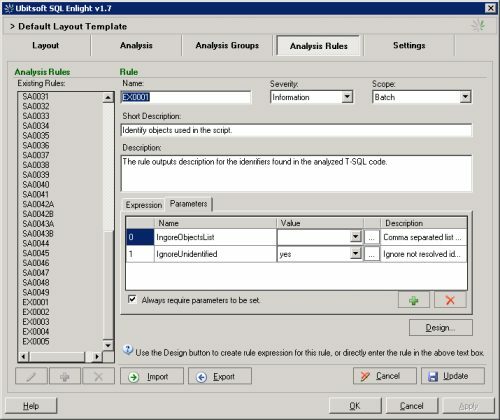 Candidates for Context Only rules are all the analysis rules which do not refer the SQML, but only use the current analysis context. The Batch analysis rules also have access to the analysis context, but are focused on the T-SQL code its SQML representation. The batch rules are applied separately for each of the analyzed T-SQL batches. For specific types of checks might be convenient to have separate implementations for the both rule types in order to cover both database schema and T-SLQ code violations. Example of such rule is SA0043 which has one implementation (SA0043A) that checks the current database schema for usage of the obsolete data types and another implementation which checks the T-SQL code for usage of those types. The explicit rules are not a separate rule type, but just rules added to the Explicit Rules group. This group is meant to store all the rules which are designed to be executed separately, because the results they produce generally (but not necessarily) are more informational than indicating defects or showing possible problems. Dynamic rules are the rules which use direct queries to the underlying database to retrieve analysis data and generate results. This kind of rules mainly process and output the server state information returned by the SQL Server dynamic management views and functions. This information can be used to monitor the health of a server instance, diagnose problems, and tune performance. We will pay more attention to each of the rule types in the next posts. Analysis rule expression is the actual implementation of the analysis rule. The rule expression can be defined using the standard XSLT syntax, but with some small restrictions to the allowed XSLT elements. The XPath expression “//o:comparison[k:null or g:expression/k:null]” matches all comparison operators having NULL as one of their operands. The call to the ‘output-message’ template is the only valid template call (‘output-error’ is still supported, but is obsolete and is not recommended). The call to the ‘output-message’ named template internally returns to the SQL Enlight engine the rule violation information that is provided from the rule. Following variables $v-rulename, $v-ruledescription, $v-ruleseverity are initialized when the rule is generated and hold respectively the rule name, description and severity. $is-server-case-sensitive – gets value ‘yes’ if the server collation is case sensitive. Create parameters for the analysis rule using the Parameters tab. A single analysis rule parameter can have none or several predefined values from which the user will be able to choose before running the Static Code Analysis command. The above expression assigns the parameter value to local XSLT variable. The Always require parameters to be set analysis rule option can be used to make the Analysis Parameters dialog always appear when the rule is applied. If this option is not checked, the default values of the parameters will be used. The Analysis Context represents the current server and database schema information that SQL Enlight loads before starting analysis. The analysis context is a XML document which holds information for the current SQL Server, the current database. The current database is determined initially from the SQL connection and later by the database switches (‘USE [DatabaseName];’ statements) inside the script. Sometimes it can be handy to be able to test your analysis rules with different than the default test analysis context. You can create your own analysis context XML for testing your analysis rules either by editing the AdventureWorks one or by using the Enlight command line tool with command ‘analysiscontext’. To be able to test your analysis rules with a specific database schema, you can use the generated context file and set it as default analysis context source at the SQL Enlight->Options->Settings. SQL Enlight analysis rules support several XPath extension functions and modules which provide features missing in XPath 1.0. For more information and reference for the supported XPath extensions, refer to the SQL Enlight documentation here. In the next posts we are going to continue and walkthrought the implementation of the different types of analysis rules and their specisifcs. I have downloaded SQL Enlight and begun to investigate it. I am very interested in the static analysis rules and making some new ones for my developers. MS Visual Studio has several static analysis rules for C# and making sure that we do not violate any of those recommendations has significantly improved the quality of our C# code. My hope is this will help us do the same for our SQL code. I look forward to the continuation of this tutorial so that I can make new static analysis rules. Please feel free to contact me if you have any questions about what we are doing and new rules we hope to add.